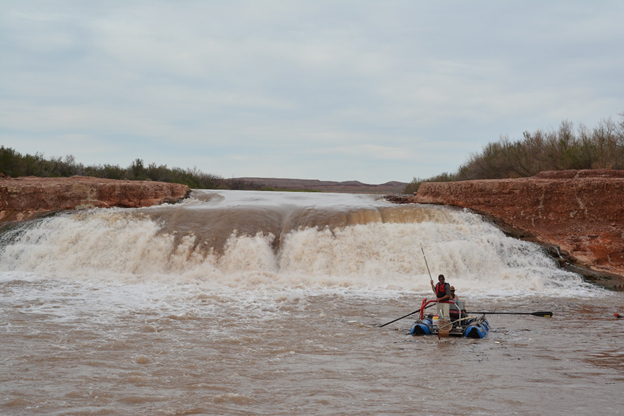 Piute Farms waterfall is a 25-ft high cascade that has formed along the San Juan River and spans its entire width. 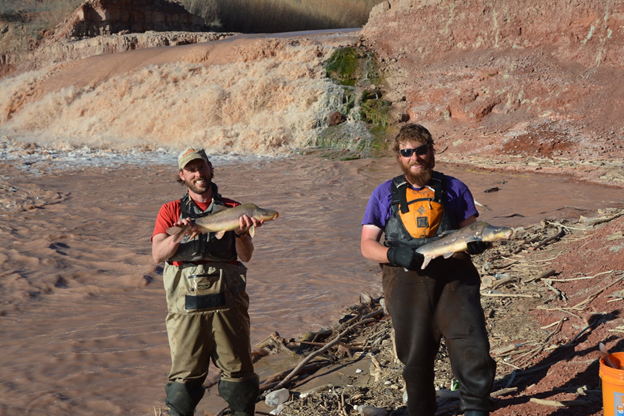 The location is a remote spot in an upstream arm of Lake Powell reservoir. To reach the falls it takes a rough two-hour drive from Mexican Hat, or a 100-mile-boat ride from Bullfrog Marina in Lake Powell. It formed when the tributary re-routed itself, cut through a thick layer of sediment, and began flowing over a bedrock cliff. Scientists call this phenomenon superimposition. 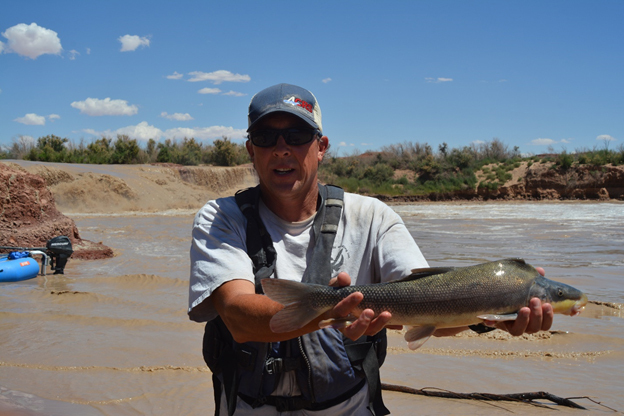 The San Juan River’s original route was buried under the thick layer of sediment. The river’s response was to form a new channel one mile south of the original route and over the ridge. With future droughts, we can expect reservoirs to be at low levels for extended periods, and superimposition will continue to occur forming additional waterfalls and obstructions. Managers monitor the positive and negative effects of these changes. One impact of the Piute Farms waterfall is a novel subpopulation of endangered razorback suckers which are now blocked from swimming upstream to spawn. Before the waterfall formed, managers were not sure what percentage of razorback suckers travelled this far upstream. Peter MacKinnon with the Quinney College of Natural Resources at Utah State University and Biomark Inc. provided the technical expertise to set up a method to insert Razorback suckers with pit tags (similar to those used in cats and dogs) then track them with antennas placed below the falls. With this tracking method, managers and researchers identified more than 1000 razorback suckers below the falls, apparently trying to ascend the waterfall. Approximately 2000-4000 suckers live in the San Juan River. It is estimated about 25% of the razorbacks are unable to spawn – because the waterfall blocks fish passage. This could influence the population of the endangered fish. The Bureau of Reclamation consulted with experts on how to help razorback suckers get past the waterfall so they can move upstream and spawn. The most feasible suggestion seems to be, to build a naturalized fish passage around the side of the waterfall. Managers and volunteers would build a trap location on the upstream side of the passage where fish moving upstream could be captured; volunteers could then release the captured razorbacks and other native fish upstream where they choose to spawn. Managers and researchers hope their information gained and recovery efforts will give the endangered razorback suckers an increased chance for survival in its changing environment.